If money is no object and you are already invested in the Amazon ecosystem, then the Amazon Fire HD 10 Kids Edition is the best tablet for kids that you can buy today, successfully merging good hardware with excellent parental controls. I've been looking forward to getting my hands on Amazon Fire HD Kids Edition Tablet since T3 first reported on it back in June, so I was thrilled to get to spend some serious time with the tablet over the past month. That's because it looked like it could be a red hot new entry to the best kids tablets on the market buying guide, with Amazon taking its Fire Kids range to a whole new level, both in terms of technical hardware spec and raw size, with the new slate packing a spacious 10.1-inch display. What follows is my official verdict on the Amazon Fire HD 10 Kids Edition Tablet, with my review broken down into key scoring areas such as design and build quality, hardware and screen, as well as parental controls and software, among others. I've also supplied some useful market information, too, which will help you complete the picture in terms of the tablet's price and availability. Who doesn't like Simon's Cat? Nobody that's who! The Amazon Fire HD 10 Kids Edition Tablet is available now from Amazon's online store, as well as from various other retailers including Currys PC World and John Lewis. The Amazon Fire HD 10 Kids Edition Tablet retails new for £199.99. 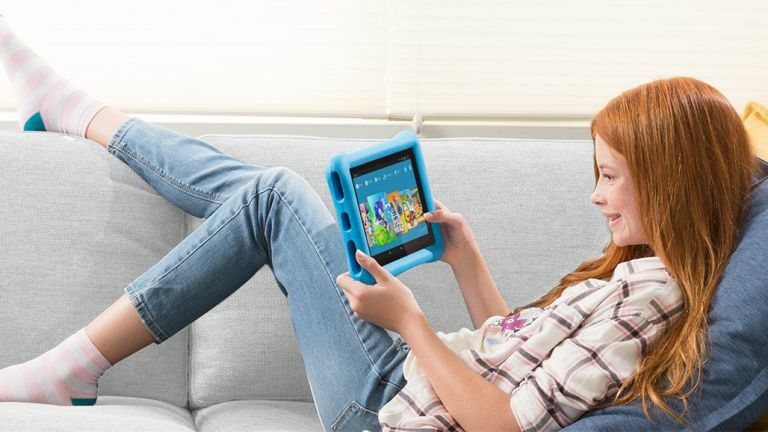 The Amazon Fire HD 10 Kids Edition Tablet is available to buy in the UK with either a Blue or Pink bumper guard. Also in the Fire Kids Edition range is the Amazon Fire HD 8 Kids Edition, and the Amazon Fire 7 Kids Edition, which retail for £129.99 and £99.99 respectively. The rubberised bumper case does a great job of insulating the tablet against mishaps. Take the Amazon Fire 10 HD Kids Edition our of the box and the first thing that grabs you is the big, rubberised case that the tablet comes in. Unfortunately, this protector only comes in (if I am being honest) the disappointingly binary colour choices of blue and pink. Limited colours aside, though, this protector is the business. Far from the lithe and streamlined cases and holders you get on adult tablets, this one is a thick, chunky, beast of a shield for the Fire 10 HD Kids Edition. The case features super easy to hold bulges in each of its four corners, a ridged, diamond-design backplate, which will make it impossible for the tablet to slip off an uneven surface, and even a deep camera recess to protect the lens. There are also well-recessed cutouts for the tablet's power and volume buttons, as well as charging and earphone ports. The rear of the tablet, with case taken off, sports a matte black finish. Remove the Fire HD 10 Kids Edition Tablet out of its rubberised casing and you are left with a pretty standard 10.1-inch tablet. There's a brace of audio vents on one side, as well as a microSD card slot on the other. The system's rear 2MP camera is located in the top-right hand corner, while the front facing VGA camera is positioned dead-centre of the top bezel. And, talking of bezels, they are very much in evidence here. Again, this is a tablet designed for use by children, and especially so at younger ages with the bumper case fitted, so its not really an issue in terms of its core usage scenarios. The rear backplate of the Amazon Fire HD 10 Kids Edition Tablet is finished in matte black, with nothing else other than Amazon's branding and the aforementioned camera lens in residence. In terms of ports, the tablet charges via micro USB, and also features a 3.5mm audio jack. The Fire HD 10 returned a single-core score of 1,455 and a multi-core score of 3,033 in GeekBench 3. In terms of internal hardware spec the Fire HD 10 Kids Edition is a technical leader in the kids tablet sector, pairing a bright 10.1-inch 1080p Full HD display (1,920 x 1,200) with 32GB of internal storage (expandable with an extra 256GB via microSD card), Quad-core, 1.8 GHz CPU, and 2GB of RAM. Outside of the kids tablet market these specs would be pretty underwhelming, but in it, and specifically considering they are tasked with running Amazon's own streamlined Fire OS rather than Android, mean that they deliver a pretty darn snappy usage experience, and especially so when running a kid's profile with the kids user interface. Running the GeekBench 3 benchmark tool returned some pretty standard scores, though, with the Fire HD 10 returning a single-core score of 1,455 and a multi-core score of 3,033. As I said, I don't think this particularly matters, as the every day usage experience is good, but it is important to note you are not landing a tablet powerhouse here. Take the case of the Fire HD 10 Kids Edition and you are left holding a solid if unspectacular design. The tablet's Full HD screen with 1,920 x 1,200 resolution is bright, crisp and displays content well. Yes, the resolution isn't very exotic, and there are no high-level features like HDR support, but for what it is intended for, to provide a quality viewing experience for children, it does the job very well. Viewing angles were on the money as well, which is something that often lets down cheap tablets, while colour reproduction was also pretty good. The surface of the screen is awfully shiny, though, which while fine when using in-doors, became a glare-filled challenge when taken outside into the sun. From playing kids games like Simon's Cat Pop Time, to watching adult films such as Bridesmaids and reading T3.com online, I felt the Fire HD 10 Kids Edition' screen delivered a good experience. Rounding off the hardware is the Fire HD 10's battery, which is rated by Amazon as delivering up to 10 hours of mixed-use battery life. My informal testing of this over a few weeks of real-time use seemed to back up this ballpark figure, although with it likely only used for leisure or light educational use, though, I don't put a terrible amount of weight on ability to last and last between charges. This is not a work-critical, communication-critical device. I can also confirm that the tablet's stereo speakers with Dolby Audio are very loud, considering their size, which is something that I am sure children will absolutely love. The parental locks on the Fire HD 10 Kids Edition are best in class, allowing superb levels of customisation. This is where the Amazon Fire HD 10 Kids Edition Tablet really shines. The parental locks are simply the best on the market today. The best-ness comes from the detail of configuration and customisation on offer, with every aspect of the tablet capable of being blocker or restricted. For example, you can individually block access to Alexa, the Web Browser, E-mail, Camera, Amazon Video, Amazon Maps, Books, Music, Photos, Audible, Newsstand, Apps and Games, among many others, too. There's also the ability to set specific usage periods where the tablet is usable via a Set Restricted Access option, so if you only want your kids to use the tablet after 17:00pm, for example, and only until 18:00pm, you can enforce that easily. Social Sharing, which any parent will know is a serious concern, is also simply blocked entirely with a menu option. Finally, profiles can also be monitored as well in terms of activity. Parental controls are accessed and enabled by password/pin-code, too, so there is no chance of them being accidentally turned off by mischievous hands. Switching between profiles takes just a second. Lastly, the Fire HD 10 Kids Edition comes with a 1-year subscription to Fire for Kids Unlimited, which is Amazon's all in one content delivery platform for children. This hooks in a wide selection (over 5,000!) of kid-friendly books, videos, educational apps, and games into the tablet that all are then free to use and consume. As with the parental controls, this is the best-in-class service of its type for children right now, and makes it a no-hassle experience to load the tablet with age-specific content. Age ranges in the service are broken down into 3-5, 6-8, and 9-12, too, so you get a pretty wide spread, and you can dictate exactly what age content is displayed. Of course, extra content can also be added from the App Store, too. But what I liked about the service most on test was that it took the effort out of delivering a broad content base for your child, and quality content, too. We can confirm the Fire HD 10 Kids Edition is good for reading the exquisite content on T3.com. The Amazon Fire HD 10 Kids Edition is the best kids' tablet on the market. However, it does carry a few caveats that you should consider before pulling the trigger. Firstly there is the expense. At £200 the Amazon Fire HD 10 Kids Edition certainly isn't cheap, and considering the that the Amazon Fire HD 8 Kids Edition retails for £129.99, and the Amazon Fire 7 Kids Edition that slides in at a very affordable £99.99, you really do have to ask yourself if you and your offspring absolutely need to stretch to this best-in-class but expensive option. Secondly you need to factor in how open a platform you want from a tablet. Amazon's Kids Edition tablets all excel in terms of parental settings, with kid profiles that allow you to dictate exactly what content the child can access, but almost as a trade-off, when in an adult profile, the experience while more open remains very structured in comparison to normal tablets. And it is a structure that means the tablet, naturally you may say, leans heavily towards Amazon apps and stores. If you are already invested in Amazon's ecosystem, which is something that I am, then that isn't so much of a problem. I do still prefer the more open experience I am used to on my Samsung Galaxy Tab S3, though, which gives me far more options in terms of customisation. Overall, though, for a tablet that is geared mainly towards kids' use I feel the Amazon Fire HD 10 Kids Edition is a cracking piece of kit. It allows a top-draw usage experience across games, streaming, and creative play, so providing you feel you and your child will benefit from the extra real-estate and hardware, and can afford its entry price, it's a no-brainer purchase.